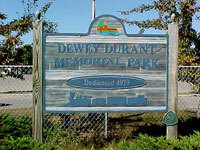 Located at 712 W. Franklin Street, Dewey Durant Memorial Park is one of our most popular day parks. The park features a covered picnic pavilion with kitchen and restrooms, three softball fields, two tennis courts, eight professional horseshoe pits and a "Peace Train" wooden play structure. The park also has a fishing pond that is popular with visitors and residents alike. The park is host to men's and women's softball in the summer as well as the Tawas "Summer Sizzler" girls fast pitch softball tournament in June and the "Bill Walsh Memorial Women's Slow Pitch Softball Tournament" the weekend after Labor Day annually. 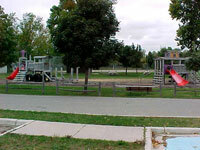 The park and pavilion are also available for private rental for company picnics, graduation parties, etc.